Last night I chose a beautiful spot right by a lake as campsite. I could see the sun rising out of my bivy bag while I was going to bed, and it hat a perfect little bay to get into the water. This “morning” (11am) was beautiful, sun shining, birds singing. I undressed, ready to take a swim/bath, walked into the water… Aaaand decided to skip the swim. I am a wuzz, I am sorry. It wasn’t even that cold, I just really didn’t want to. Besides that , well… Couple km later at the last stop in Sweden I realized that my much loved rear wheel had a broken spoke. What a surprise. I guess my power ride from yesterday was just too much. No, it’s not exactly the spoke I had the bike shop replace 2 weeks ago, of course not (sarcasm). 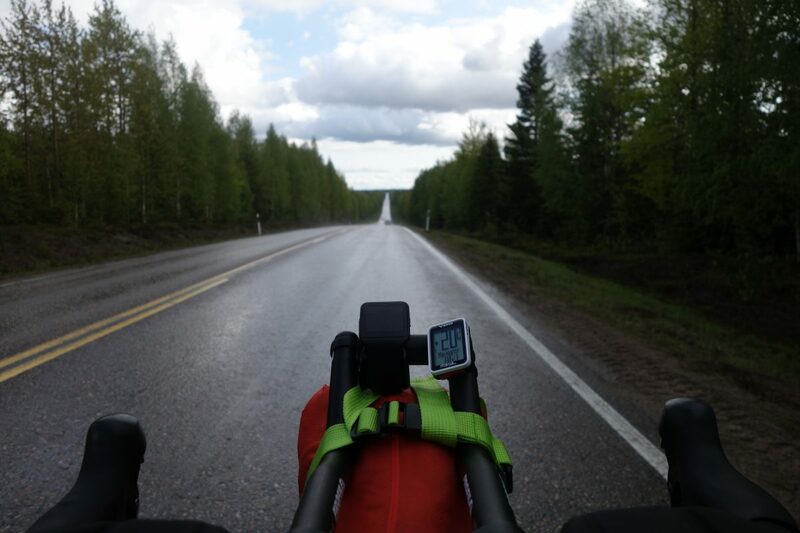 The rest of the day consisted of cycling north, crossing the polar circle and then turning southeast. Mood wise I’m now in the stage where the routine set in. I don’t have any real short term goals and distraction is hard to come by. I’ll have to make 2 turns tomorrow, that’s the current level of navigational difficulty… So I am listening to podcasts and shifting my saddle from time to time, to see whether I can find a reasonable position for my knees, where they don’t hurt after a couple of hours. and not as comfortable as here. it’s yours, because you can. You wrote that routines set in, but let me say , this will happen the rest of live, but you can. You can manage that this will be only a short time and what i see, you do this very well.